Shop Universal Audio 710 Twin Finity Microphone Preamp from AMS with 0% Interest Payment Plans and Free Shipping. The 710 Twin Finity uniquely combines both the classic retro warmth of UA tube design and the transient bite of solid-state. Housed in a 2 rack space, half-rack, all-metal chassis, the 710 Twin Finity was created specifically to add the tonal versatility and sonic inspiration missing from generic audio interface preamps. 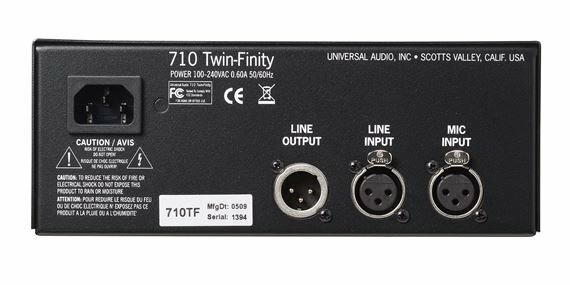 Versatility makes the 710 Twin Finity the perfect preamp partner for any mic collection. Plus, the discrete JFET DI input circuit can also easily handle any electric instrument. Guitar and bass players will especially appreciate the 710s ability to bring out the best of both active and passive pickups. 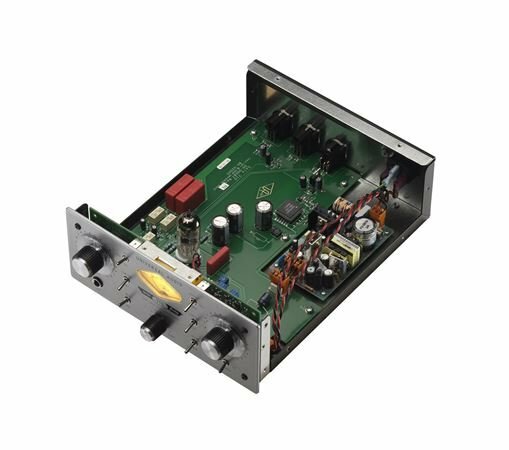 The key to its sonic flexibility lies in its innovative circuit design, featuring a solid-state transimpedance input amp simultaneously driving separate, phase-aligned tube and solid-state gain stages, which are then summed to a single output.. The mix between the 310 volt single-ended class-A triode tube stage and solid-state transimpedance stage is controlled via the Blend Knob. Blending is continually variable between 100% tube and 100% solid-state offering a practically infinite range of unique pre-amp tones and the ability to easily dial-in your own signature sound. Like all our other preamp designs, the 710 Twin Finity features dual gain-stage controls (Gain/Level) which can radically vary the amount of coloration and distortion by allowing you to crank up the input gain like a guitar amp. The VU meter features a unique Drive mode allowing you to see how hard you are driving the input stage. I was looking for a mic pre amp and this one is doing the job for me! Nice clean sound and the tube on vocals is Amazing!! Real good machine! It got my studio sounding real good. Basically giving this thing away! Vocals, Guitars(ele/acoustic), Bass, Drums, Voiceover/Podcast..... I use the 710 every single day without fail! Great Product, Great Price! The Universal Audio 710 Twinfinity is one of a kind, especially with the fact it gives you the option to change between tube and solid state, it’s well worth the money. This Mic Pre is well worth the money. I am getting very good quality using a Warm Audio WA47! Great sounding amp.. I still need more time with it but it adds a new dimension to my at home studio! I've added this preamp to my studio for a broad range of applications. Primary, however, is to add some tube goodness to tracks. This is a very well built and great sounding preamp. And with the choice of 'clean' or 'smooth' (solid state v. tube) tones it is quite versatile and quiet. Yes, this mic pre is made well. The mic pre sounds great. I wouldn't go full tube on vocals. I saw a suggestion to change out the tube which is an excellent idea. The SS side is very sweet - pretty good gain and vocals are sweet. Bass is sweet on the tube side b/c of that bit of distortion. UA compressors aren't what I'm used to but it's no problem getting to know this mic pre. You can't go wrong with UA. The SS side is really really sweet. It's hard to describe. You would have to hear it. Amazing. I used an AT4050, a Neuman TLM103 among other mics and this is by far the best sound I've achieved. I even compare it to the LA610 which costs a lot more. This mic pre is so good, I have abandoned my quest to get the LA610. I have even decided to buy the 4 channel version. There is no way you can go wrong with this mic-pre. I have used Focusrite, among other mic-pre's and this is by far the best value.